In one of the Chikiwi (white chicken) birthday party, hungry black birds came attack and kidnapped the chicks. Birthday party became chaotic. Chikiwi tried to chase but unfortunately she couldn't fly. 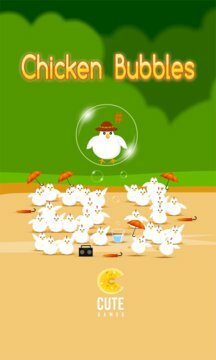 Luckily, another chicks make magic bubbles that could bring Chikiwi flies away to rescue her kids were kidnapped. 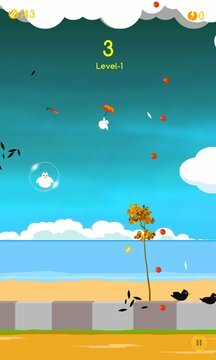 Help Chikiwi to rescue the chicks by giving an umbrella. Attack the birds with the fruit bombs and bees. * Simple one touch controls. * Stunning graphics with a highly polished interface. * Easy to start, yet challenging to fully master. * Shop: Buy a special hat and electric shocker with coin. If you love popular games like Tahu Bulat, Tebak Gambar, Mekorama, Clash of Clans, Crossy Road, Chameleon Run or Hay Day, you shouldn't miss this game. This game is perfect to play while watching the Euro 2016 football. Keep flying and rescue all the chicks!